The other day, an American journalist wanted to talk about the Sweden Democrat’s role in the upcoming Swedish election. Being no country specialist, I tried to deflect the request, but he sent me some more specific questions anyway, which I tried to answer to the best of my abilities. Would you characterize the Sweden Democrats as a radical right party? How similar are they to other radical right parties in Europe? What is different about them? Yes, I the Sweden Democrats fit well into the family of Radical Right parties that have emerged in most West European countries since the 1980s. The most unusual thing about the SD is perhaps that they started out as a pretty militant group, with uniforms reminiscent of the 1930s. Many modern European Radical Right parties have carefully avoided this association from the start. It seems to me that the Sweden Democrats have done a lot of “soften” their image, with their flowery logo and the party leader’s choice of clothes. Is this something you would agree with? Is this something other radical right parties have adopted? That’s correct. The new-ish leadership has banned the uniforms, purged the ranks of Neo Nazis, and replaced the fierce Viking warrior of their original logo with a flower. Their relatively moderate appeal is very much in line with other Radical Right parties. How important is this election in Sweden in determining the future of the European Union? For the time being, no other party will form a coalition with the SD, so their likely success will have no direct short-term impact on the EU. 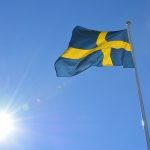 However, having a strong Radical Right party in the Swedish parliament will make it more difficult to form a stable government and will likely lead to Swedish mainstream parties adopting more nationalist and restrictive positions. Do you think the Sweden Democrats are further evidence of a rising tide of nationalism across Europe? What is behind this rise? Immigration? Neo-liberal economic policies? Economic hardships? Changes in society? Radical Right Parties that poll between 10 and 25 per cent are now a fact of political life in most West European countries, and in all likelihood, these parties will also do well in the 2019 EP elections, where the barriers to entry are particularly low. One important but often overlooked factor behind this rise is dealignment, i.e. the slow but steady decline of the long standing ties between large social groups such as workers, farmers, or religious groups on the one hand and traditional parties on the other. Through dealignment, voters have become available for new parties including, but not limited to, the Radical Right. One second important point to note is that the Radical Right vote is driven by perceptions of migration as an economic and cultural threat. While these perceptions are by no means confined to the Radical Right’s electorate, they seem to constitute a necessary pre-condition for Radical Right support: unless someone is seriously worried about immigration, it is highly unlikely that they would ever vote for the Radical Right. Third, economic decline plays a role, but many Radical Right voters are relatively well of themselves. What worries them is a feeling that their native compatriots get less than they deserve, that the country is going into a negative direction because of immigration, and the (often irrational) fear that immigration might hurt their own economic prospects in the future. It is also worth noting that the Radical Right is particularly strong in the rich and stable countries of Scandinavia and in Austria and Switzerland, whereas it is surprisingly weak in crisis-hit Greece and nonexistent in Spain and Portugal. Here’s a question unrelated to Sweden … How significant of a role do you think Steve Bannon can play in Europe? Bannon plays no role whatsoever. Populist Radical Right Parties have thrived in Europe since the 1980s. International co-operation amongst them has proven difficult time and again because of their inherently nationalist agendas, but they were quite good at learning from each other and swapping ideas long before Bannon began his European tour. In my view, Bannon hugely overplays his influence in Europe, and American media sometimes fall for his spiel. How many votes polled the Front National in the 1993 election (12.7), and how much did they get in the first round of the Présidentielle 2007 (10.4)? Which party did control the German Foreign Office from 1987-1998 (obviously, the FDP)? What is the typical turnout rate in Slovenia (between 60 and 70 per cent over the last four parliamentary elections)? If you need answers to these and similar questions, i.e. 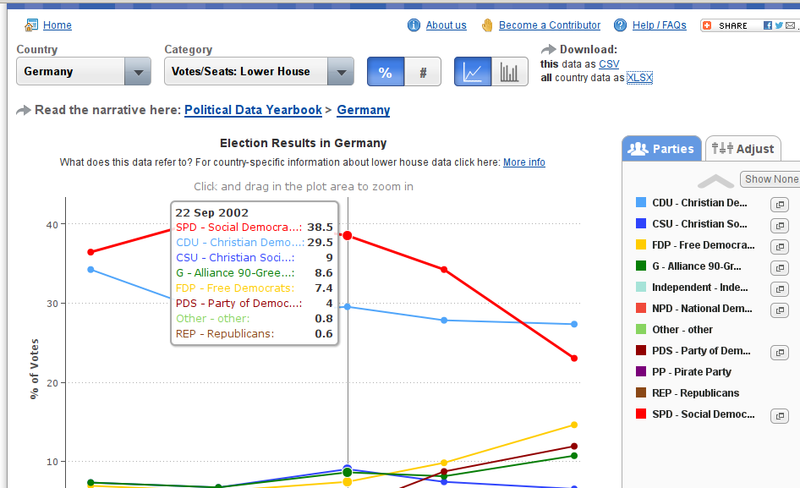 if you work in Comparative or German/French/Whatever Politics the Political Data Yearbook has been your trusty companion since 1992, saving you endless hours you would have to spend digging up references in odd languages. For twenty years, the Political Data Yearbook was published as an addendum to the ECPR’s flagship journal EJPR. Last December, it became even better with the creation of the Political Data Yearbook Interactive, a website full of flashy and, well, interactive graphs. While they are nice to play with, for me the real game changer are the download links: Everything on screen and some more is freely available as CSV/XLSX, ready to be imported into Python, R, Stata, or whatever might be your favourite tool for data mangling. No more hours keying in things data already were digital before they ended up on the page in front of you. I wondered briefly if this is sustainable, then realised that Wiley is not going to lose any subscriptions to the EJPR because of the data base. Quite to the contrary: People will love this, gaining Wiley some open data kudos and almost free PR. I’m sure, someone, somewhere even uttered the dread word “win-win”. 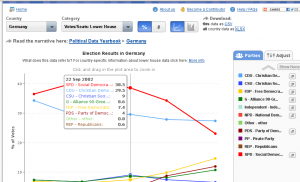 To celebrate the launch of the Political Data Yearbook Interactive, Wiley is kindly sponsoring a reception at the upcoming ECPR Joint Sessions 2013 at the university of Mainz. Since my extremely capable people are in charge of the catering (handcrafted bubbly – locally sourced, obviously), this is going to be splendid. If you are attending the conference (or just happen to be in the sector), don’t miss it. Thanks to these new-fangled social media things, you can even register your intention to participate.